I have run three warrior dashes, tough mudders and 6 spartan races inculding the trifeta last year. I did all these races while being fat. The lowest weight before a race was 243 last April for the Las Vegas super spartan. Yesterday, I ran a warrior dash with my family and I weighted in at 265 and with 35% body fat. With that being said i can say that i was not out of shape, there were plenty of time that I would pass other runners that were a lot skinnier then me. You might be wondering why I am telling you this? The reason, I am tired of being fat and my eat anything lifestyle for the last twenty years has cought up to me, I have been recently told by my doctor that I am diabetic with type two. It is time for a change, NOW! Get my blood sugar under control. Run a warrior dash, 2 tough mudders, earn the spartan race trifecta and finally run the Worlds Toughest Mudder for 2016. Well that will be my next post. Thanks for reading and keep preparing for the next, what ever the next may be. This is what I carry with me most of my waking hours. There are times and a situation when it is impossible to carry these things but for the most part this is what I have. When I say a true EDC, what I mean is, this is really what I carry you can look and see the ware marks scuffs and dirt on my items. 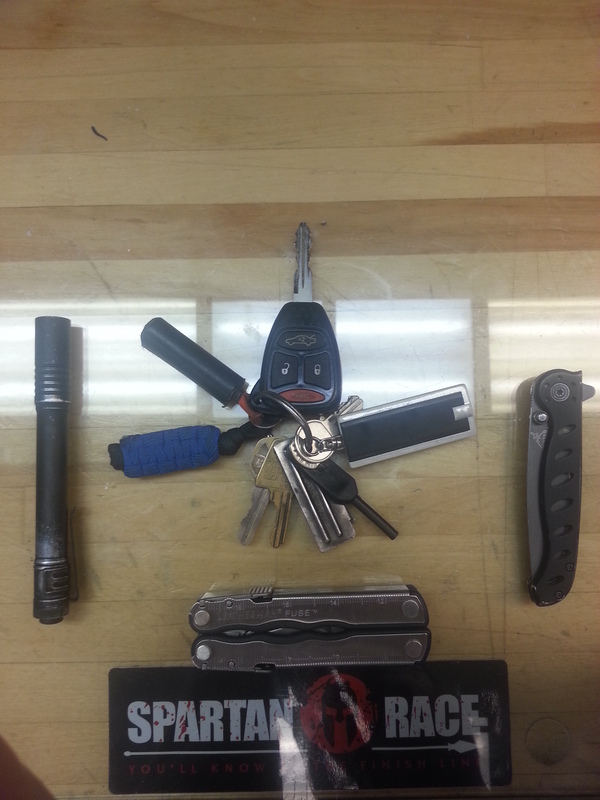 Unlike other pictures where someone went out just purchased their EDC at the store, just to take a picture. ts in my pocket. The next item that I carry all the time is a Leatherman Fuse, I personally don’t care what type of multi-tool and what model a person carries but I think everyone should have one. I like Leatherman and I really like the scissors option on mine so that is what I carry. Now there are few items that I am still working on to add to my EDC, the first one is a high quality personal defense knife. I have tried a few but have not found the one I that is comfortable for a all day carry. The next item that I am looking in to is a holster for my spare magazine when I concealed carry. Lastly, I really need a good pepper spray and holster when I am carrying my sig. The reason I need this is because I would rather pepper spray someone then shoot them. Just think what the outcome would have been if Zimmerman was carrying pepper spray. These are the items that I carry everyday and for the most part these items will allow me to take care of my everyday needs and most emergencies. Now I am not saying that this list is the best and you should carry these items. This is what I carry right now when I find something else that works better for me I will let you know. Until next time keep improving yourself, your skills, your equipment and your life. I have been taking a cardio kickboxing class for the past two months and I have have gotten a lot more out of the class then I thought I would. My goal for starting the class was to get in to shape and the class has surpassed that goal. After every class I am exhausted and a different muscle hurts every morning from the previous evening class. But the surprise is that I am also learning to fight. Now I am not planning on fighting anyone but learning to do so allows me to feel better prepared of I ever have to use those skills. The third advantage that I am getting out of this class is that I am creating relationships with people that I would never have met if I did not take this class and the more positive relationship a person has in their life the more fulfilling life they will have. Now this just a theory of mine and I could be wrong because I lucked out and found a great class right of the bat. But when you are looking for a kickboxing class I would look for a mixed martial arts gym. That is where the fighters are going to be and they will always be looking for a way to bring in some extra revenue. I would stay way from the big box gyms because I would think their classes would be more cardio then kickboxing. I bet the best question to ask is does the class punch and kick bags and pads or do they just kick air. Until next time remember always be preparing for the next because you do not know what the next will be. This has to be one of the all time best speeches ever made about getting a head in life. The time has come to become a country warrior.